Museum of Science staff, Larry Bell and David Sittenfeld, took part in the 21st Annual CNSF showcase on Capitol Hill to share with Members of Congress and their staff the work and accomplishments of the NISE Network in raising public awareness and engagement with nanoscale science, engineering, and technology and other developing fields (like synthetic biology). 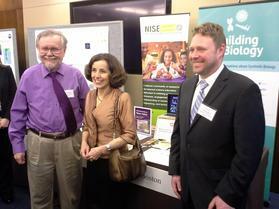 NSF's Director, Dr. France Córdova, even had the opportunity to stop by the NISE Net table to talk about nanotech and synbio outreach! Check out the social media coverage about @nisenet by @NSF_BIO. Pictured (from left to right): Larry Bell, Director of NISE Network and PI of MSPES-SynBio Project, Dr. France Córdova, Director of NSF, and David Sittenfeld, Co-PI of MSPES-SynBio Project. Submit Your Report Today! - We appreciate your NanoDays 2015 feedback and want to remind all our partners who received a 2015 physical NanoDays kit to submit an online report. Required reports were due May 1st, thanks to those who already submitted; if you haven't yet submitted a report please do so right away. More information about how to submit your report here. View National NanoDays Coverage - Find events, videos, photos, online press, and media coverage at NISE Net's NanoDays 2015 Media Round-Up. Share Your Photos - Did you capture NanoDays-in-action? We would love for you to share your NanoDays photos with the Network. Overwhelmed by Kits? - Partners share how they stay organized and keep their kits available for easy, everyday use [read NanoDays blog post]. Join the Upcoming Online Brown-Bag: Beyond NanoDays - New Ideas for Presenting the Smallest Science - Learn creative ways your colleagues are introducing nano outside of NanoDays! Everyone loves NanoDays festivities but how do you keep visitors excited about nano the rest of the year? Join us to learn about three innovative nano projects that may just inspire you to try something new! Special Evening Event at the Children's Museum of Indianapolis - Thursday, May 14th from 6:30-9:00pm. Check out NISE Net hands-on activities in the Biotechnology Learning Center. Pre-registration is required. Exhibit Hall - Stop by the NISE Network booth (#505) on Thursday, May 14th to visit with partners and learn about new Network opportunities and more! Professional Development Sessions - Don't miss NISE Network partners featured in a number of sessions about engaging the public in nano. Oleophobic Surfaces - Anti-Graffiti Demo - A NISE Net short, hands-on demonstration for visitors to explore surfaces that display oleophobic, or "oil repelling," properties and the benefits these surface coatings can provide. Biomimicry: Synthetic Gecko Tape through Nanomolding - A NISE Net long activity will guide you in making a synthetic gecko tape with micron sized hairs that mimic the behavior of the gecko foot in a process called "nanomolding." In her position as Program Director for Education and Outreach at Penn State University's Center for Nanoscale Science, Kristin Dreyer's initiatives reach a wide range of audiences. For NanoDays 2015, she planned three different events targeting children and families, research colleagues, and grade 6-12 teachers. Working to leverage the intersection of these events, Kristin recruited graduate student volunteers who could commit to participating in all three events to achieve "bigger picture" broader impact goals. Coordinated through a local museum partnership, the first of these events was a festival-style NanoDays event hosted by the Discovery Space of Central PA, who provides engaging science experiences for children and families. The second event took advantage of a weekly café designed to promote interdisciplinary research collaborations at Penn State and talk with colleagues about outreach opportunities using NanoDays kits. Finally, in collaboration with Penn State's Center for Science and the Schools (CSATS) and several other university partners, she organized a workshop for grade 6-12 teachers to build knowledge about nanoscience and design learning activities that model scientific research skills. Like many NISE Net partners, Kristin and her team enjoy the flexibility of the NanoDays kits to mix and match activities into a cohesive theme and to support specific learning objectives. For the teacher workshop, hands-on activities were used to help teachers learn about the innovative emerald ash borer research being conducted by an international team of scientists, including researchers from CSATS, who have developed nanofabricated, electroconductive decoys that replicate the beetle's wing nanostructures. Throughout all these events, graduate students gained valuable skills including developing flexible communication skills, realizing the value of adapting the same activity to diverse audiences, and having the opportunity to share their own research. Graduate students also found these experiences renewed their own inspiration for science and they cherished the opportunity to be role models for the next generation of scientists. Continue to the full Partner Highlight to read more about Penn State's NanoDays 2015 activities. Videos produced by researchers and educators about NSF-funded work that strives to improve teaching and learning of STEM subjects will be showcased online. You're invited to view all the video presentations, join the online conversation, and vote for your favorite presentations when the event goes live May 11-15, 2015. The NISE Network has submitted a video that highlights a museum-scientist partnership between the Marbles Kids Museum, Duke University and NC State University [watch NISE Net video submission]. Be sure to check it out and vote! For more information go to http://resourcecenters2015.videohall.com/. The Materials Research Society announces its Call for Papers for the 2015 MRS Fall Meeting. Abstract submission opens May 18th (abstract deadline June 18th). Having become a valuable staple within the technical program of the MRS Meeting, the Education Symposium is also accepting symposium topics (proposal deadline May 15th). If you are interested in helping to co-organize a symposium, go to http://www.mrs.org/education-symposium-planning/. The 2015 Network-Wide Meeting will be held in June at the Saint Paul RiverCentre and the Science Museum of Minnesota in Saint Paul, Minnesota. This meeting will be attended by nearly 300 NISE Network partners and will feature: keynote speakers, concurrent sessions, and opportunities for attendees to share their own work. Due to budgetary constraints, this meeting is by invitation-only, however, we will make digital versions of many slides and handouts available following the event. Dealing with any invasive species is an ongoing battle, including the fight against the emerald ash borer, which the U.S. Department of Agriculture Forest Service claims to be the most destructive forest pest ever seen in North America. Introduced in 2002 from China, the emerald ash borer has killed tens of millions of otherwise healthy ash trees. An international team of researchers has successfully created nanofabricated, electroconductive decoys of female beetles using a bioreplication process that retains the nanoscale surface texture of the beetle. According to one researcher, the light-scattering properties of the beetle's shell also made the decoys more lifelike and more attractive to males. Researchers continue to further improve the decoys and traps to maximize their potential as part of an early detection tool for this invasive species. Can't keep you warm though. Read the Nano Bite e-newsletter online at /newsletter/nano-bite-may-2015.